Hearing from others in response to my first post on this subject got me thinking. Dangerous, I know. First, I’ve thought about how none of us are innocent in the problem. Most job descriptions for pastors are focused on satisfying the consumer-driven tendencies of our culture because we are driven by the same. We all have some blood on our hands. I know I do. One of the reasons we are like this is all the wealth and freedom we have. Our wealth makes it near impossible for us to be content with what God has provided, and that includes what he has provided ecclesiastically. So we pine for me. The best we can afford. And our freedom gives us many churches and pastors to hear from. You put those two together in the pastoral search and it can get and does get awful. many of them sound like PR campaigns done by HR departments. And we haven’t even talked about the lure of salary and benefits. But I think there is a better way of doing things. Someone asked me how I do it. And my answer came rather easily. Instead of churches and search committees making public their job description, they should not make it public. Ask those interested and those they are interested in to send them some thoughts on a job description and then see how well those fit with what the church wants in a pastor. Why not come up with one that is very bare bones and amendable? None will fit perfectly and that is probably right and good. A pastor is likely to know more about what a pastor should be than a committee of lay-persons. Just as an computer programmer will know more about programming than an hiring manager will. Certainly any pastor worth hiring would be worthy of learning from in the process. How could expect to be led by him after he is hired but not at all before? So any job description should be amendable. The great problem with the process as we have it now, is that it’s too much like the dating i did in High School in college. Everyone is on their best behavior and trying to impress each other in the very beginning. All weakness is hid. All failures are swept under the carpet. Both parties try to show off a little by dressing up. I’ve written about this here and here. If churches would just keep their job descriptions to themselves and ask candidates to provide them with one to see if they just might match up, then you would cut much of the consumerism off at the knees. There is never a guarantee a process will work out perfectly. But if the goal of the process is to model the very gospel by which we have have all been saved, I think the process can be more healthy. So I’ve been looking at pastoral job postings. I usually look at only the ones in my denomination, which for the most part, are pretty good. But I’ve started looking at all of them. Just to see what churches are looking for in a pastor. It can be depressing. Especially since I’m reading Eugene Peterson’s memoir, The Pastor. One of themes of the book, as well as all of his books on pastoral ministry is we have reduced church life to a consumeristic enterprise and the pastor is a hawker of spiritual goods and services. The pastor, who is supposed to be the one who introduces the people to God and directs the people toward what he is doing, has in America, become a businessman. So Peterson has in some ways ruined me. His picture of ministry which places prayer in a prominent place seems so at odds with the way we think. And honestly, even at odds with the way I’m prone to think sometimes. Prayer doesn’t look busy. It doesn’t seem to make things happen. And we are a culture of busyness and making things happen. We want quick results and prayer vitiates against that. I see this with my family. And myself. One of the reasons Peterson has been so helpful, is that I tend to look at Pastoral work and my desire to return to it as what I want to do and what I will do. I suppose that’s a natural way of thinking. But he gave me a picture of pastoral ministry where God is the one who effects growth and change. I know that sounds ethereal and possibly cliched but hang with me here. We start with thinking these things will work and then we leave them off because we cannot see the progress we expect. It’s too slow. And again, I cannot help but but smile as I type this, because I do this with my kids. So obviously I can’t be too hard on people and search committees for thinking this way about pastoral ministry. We’ve all breathed an ecclesiastical air that has pastors swooning with the idea they are there to fix what is wrong. And churches often look to them to do it. And even more often than not they cannot deliver what is needed. And then everyone is frustrated. And severance packages are paid out and new committees are formed to find the answer. Guys like me aren’t frustrated merely because they want to do and be something other than what is expected of them. They are frustrated because the work of ministry they were initially called to has evaporated or been suffocated under a lot of other work. It’s not what initially made their hearts break for the souls of men and women. And now there is a palpable fear that God could draw himself away from the work they are doing and no one would know the difference. Everyone is still busy. Everyone is fixing problems. But really the glory has left. My wife says I’m the weird one. Maybe it’s because I left and I’ve had time away to reevaluate what I was as a pastor previously and what I want to be. I’m now too acquainted with my own weakness to want to go forward with anything but my weakness. So I keep coming back to Paul’s words to the Church at Corinth when he reminds them that God has chosen what is weak and appears to be weak to make his strength known. They have the ring of good news about them. That sounds like a good pastoral job description to me. What follows is a description of the kind of pastor I want to be. 1) If I’ve learned anything over the past few years, its the difference between ministering to people with a theology of glory instead of a theology of the cross. When I was a pastor the first time around I worked out of the first paradigm. It bred an arrogance that placed me in a place of importance over against the people I was called to serve. If the cross is true then it is not only the power by which we minister, the message we preach, but also the example of how we must deal with those whom we are called to. There must be a kind of laying down of our lives for people. The pastorate is not a well-paid therapist but a shepherd with sheep he must be willing to bleed for. 2) I want to bury them. My ministry for the most has been some time here and some time there. Sure, good done everywhere. I’m thankful for those times of service. But I want to be somewhere long enough to watch them grow old and then bury them. 3) I want to preach and teach and counsel in a way that betrays the steadfast loving-kindness of God and his gospel of what he has done in Christ for sinners. I bought into a way of preaching and teaching that said conviction of sin was the measure of power in preaching. If they were convicted and felt guilty, mission accomplished. Sometimes, yes. But sometimes God’s people need to hear, “You are not alone” and “Be not afraid.” “You are forgiven. Relax.” You don’t have to buy into Osteen’s theology to see the resplendent kindness of the message throughout the Scriptures to comfort the wounded and sad and hurting. 4) No easy answers. There are none. Our bumper sticker theologizing is killing the soul. And those who long for easy answers will not be patient with those who don’t accept them. And our culture is full to the brim with those who will not tolerate them. I want to be patient and live comfortably with the tension. 5) One of the things I struggled with in ministry was the work/life balance. I did not handle this well. Every intrusion was unwelcome. I started ministry seeing anything that cut into family time as an intrusion to the way things should be. Some pastors err on the side of neglecting their families. I erred on the other side and never saw the blurred lines between ministry and family as a good thing. When I left the ministry, I looked forward to a job where you clock in and clock out. The only thing that could have convinced me I was not made for such a job is actually doing that kind of job. I know this sounds crazy, but if someone called me in the middle of the night for counsel or to rush to someone’s bedside, I would revel in the opportunity. That’s not bragging. I’ve been through much fighting within to feel this way. 6) Just because I want to bury them doesn’t mean I want to kill them. I’ve been in the workforce for over 2 years now. And I’ve seen two things I could not have seen otherwise. Volunteering for the church is a real sacrifice when it is not your job to do so. And I’m sure I’m *not* an ideal volunteer so I need to be patient with those who are reticent. People are busy. Probably too busy. But telling them that doesn’t work. I want to be patient when people are slow to volunteer. My first reaction was to assume they don’t care about the church. It wasn’t fair. 7) The push and pull of suffering teaches you something about prayer. Especially when the troubles persist. Prayer is powerful. It changes you. And you find yourself praying just as hard and often when the suffering wanes and you find yourself more ready when it waxes anew. If Eugene Peterson has taught me anything about the pastorate, it’s that I wanna pray more as part of being a pastor. It’s more important than study, counseling, teaching and vision plans. 8) Honestly, my critics were nearly always people to be dismissed. That was a mistake. Truthfully, I was most likely worse than they knew. But I knew it. And I was defensive. I don’t want to fear criticism anymore. 9) Somewhere I bought into the idea that because I was the leader, I knew what was best for the people I was leading. I knew what the people needed far more than they did. It’s really a lonely way to live. But I was often working with elders and men and women who had invested a great deal of their lives in that congregation. It doesn’t mean they would be right in their thoughts about the direction and decisions about the church and its purpose. But those opinions should be respected. Maybe, just maybe, if I’m attentive in prayer and in study of the Scriptures, we can makes those decisions together in a way that honors God and edifies the body of Christ. 10) I don’t want to be afraid of offending the powerful but I do want to be afraid of not caring for the marginal. 11) The work of Jesus to save sinners and make all things new is to be central. I want that more than anything. 2) My 10 yr old daughter told me she can’t wait till high school so she can study chemistry so I’m wondering where I can get a paternity test done. 3) One of the best ways to deny someone’s dignity is to ask them what their thoughts are on something and then immediately argue with them. 4) This past weekend Bethany and I celebrated our 15th Anniversary. The kids stayed at my mom’s, we ate out, slept in, went hiking and sold a car. You know the stuff you’d expect to do on an Anniversary weekend. 5) Ichiro once had 262 hits in a season where he played 160 games. Think about that for a moment. 6) My time working in the business has been a masters level instruction in humility, patience, and kindness. I’ll never graduate. 7) My surburban Wal-Mart is more diverse than…well, anything. 8) Only a person in their 20s would ask me in my forties why I eat bran every morning. 9) Spring in Birmingham is one of my favorite things. The sights and smells and feels stretch back into childhood and all the hopes and dreams of warm weather and long days. 10) There’s a ragged beauty in honest hurting people – the poor in spirit, I suppose. Tony Gwynn averaged 209 hits for a 162 game average. That’s averaging more than one hit per game over his career. That makes sense because he had 10,232 plate appearances and had 3141 hits. He most likely always had 4 at bats a game. He averaged only 29 strikeouts over a 162 game average. That’s one strikeout every 5.6 games. And that’s just otherworldly. Those numbers are better than Joe D’s. DiMaggio did have far more homers, RBIs and runs. But remember he played on 10 pennant winning teams, nine of them winning the World Series. Gwynn played for the Padres. They both averaged 36 doubles over a 162 game average. But Gwynn had 3x as many stolen bases. Joltin’ Joe got more than 200 hits twice in his career. Gwynn did it seven different seasons. Seven. And Gwynn’s highest batting average is higher than Joe’s. His lowest is also higher than Joe’s lowest. But he played for the Padres. So, yeah. I miss being a pastor. I’d rather eat fried pork skins and wear crocs than wear skinny jeans and eat kale wrapped in marketed fear. If theology does lead to love for others then we are doing it wrong. And my guess is we are doing theology more to be right than loving. For the cross is the centerpiece of all theology and the cross is where we get the power and example of love for others. The older I get the more I believe it is not the strong with the answers who we should be listening to. But the weak who’ve had to ask all the hard questions in search of strength beyond themselves. One of the more interesting story lines of the coming baseball year is Ryan Braun. He lied about using steroids, got caught and is now back. And he’s hitting .875 in Spring Training. And getting booed a lot. The thing is, he probably didn’t need them. The guy can hit. And if he can hit after all this, well, that will be very interesting. If as Christians we wanna be holy and set apart from the world around us, we must not be motivated by money. Our sexual morality will impress no one. But men and women uninterested in wealth are a force to be reckoned with. 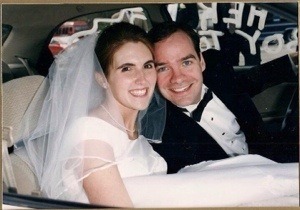 Fifteen years ago today, Bethany and I were married. How happy are we in marriage? We would not trade our modest celebration this year for anything, really. Our lack has shown us what we have in each other. It’s a relationship of grace upon grace.